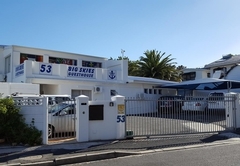 Big Skies Guesthouse is one of the highly recommended Gordons Bay guest houses and provides accommodation in 7 guest rooms for tourists visiting the Cape Helderberg region. 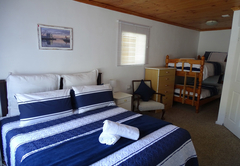 Big Skies Guesthouse offers lovely accommodation and a warm friendly welcome. 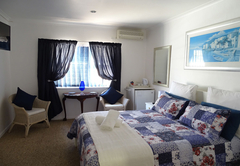 The Guest House is situated only minutes from Gordons Bay beach, magnificent restaurants and numerous shops. 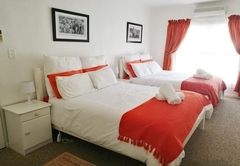 When staying at Big Skies Guesthouse you are 30km away from the airport and 50km form Cape Town City Centre. This is a fabulous place to base yourself while exploring all the Cape has to offer. All rooms come with complimentary toiletries and hairdryers. 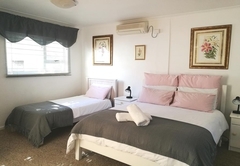 Rooms are air-conditioned and equipped with a fridge, TV (cable channels) and DVD player. 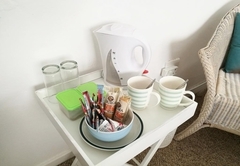 You will find coffee and tea making facilities in all the rooms. 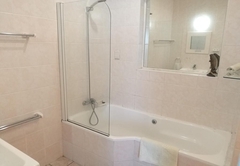 Rooms come with a private bathroom fitted with a bath or shower. One double bed and one set of bunk beds. 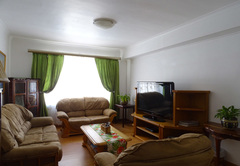 Air-conditioned and equipped with a fridge, TV (cable channels) and DVD player. 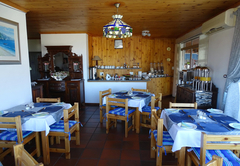 You will find coffee and tea making facilities in all the rooms. 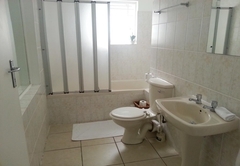 Rooms come with a private bathroom fitted with a bath or shower. 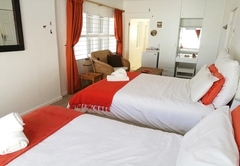 One double bed and one ¾ bed, air-conditioned and equipped with a fridge, TV (cable channels) and DVD player. 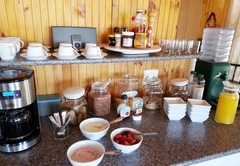 You will find coffee and tea making facilities in all the rooms. 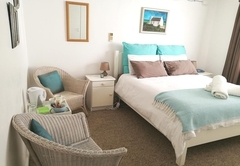 Rooms come with a private bathroom fitted with a bath or shower. 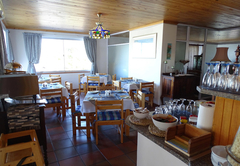 Breakfast is served each morning between 08h00 and 10h00. There is free Wi-Fi on site as well as a a swimming pool available for your use. 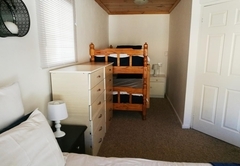 Standard double rooms have a queen size bed, vanity unit and BIC. 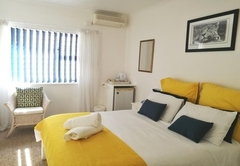 All rooms have aircon, a fridge, 32" TV with selected premium DSTV channels, tea/coffee making facilities, electric blanket, hair dryer and a safe. All rooms are en-suite. Room has a queen size bed set of bunk beds and large ensuite bathroom. 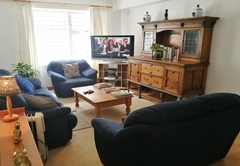 It is air-conditioned and comes equipped with a fridge, 32" flat screen TV, selected premium DSTV channels, coffee/tea making facilities, electric blanket, hair dryer and safe. 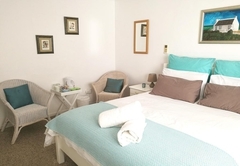 Spacious light room with two queen size beds and large ensuite bathroom. 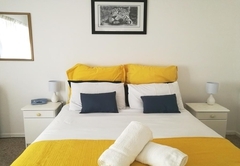 This air-conditioned room comes equipped with fridge, 32" flat screen TV, selected DSTV channels, electric blanket, fan, hair dryer, tea/coffee facilities and safe. . 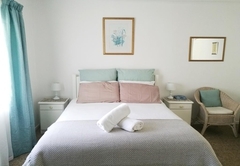 Spacious room with queen bed, single bed and ensuite bathroom. There is a handy desk/work area. 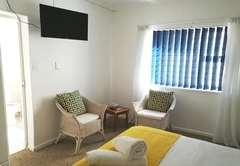 Room is air-conditioned with 32" flat screenTV, selected premium DSTV channels, fan, fridge, hair dryer, safe, electric blanket and tea/coffee facilities. 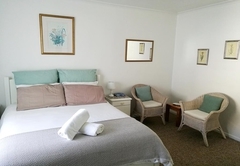 Our economy double room has a queen size bed and ensuite bathroom. 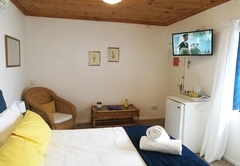 It is air-conditioned and equipped with fridge, 32" flat screen TV, selected premium DSTV channels, tea/coffee making facilities, electric blanket, hair dryer and a safe. Tracey and her husband are the best B&B hosts. 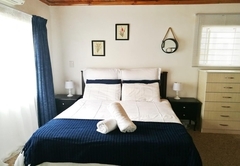 I stay in a lot of venues on my travels around South Africa for work and found BigSkies one of the best.It is within walking distance to the beach and shops, safe parking,excellent spotless rooms and friendly efficient staff.Thank you for a very pleasant peaceful and comfortable holiday! Response timeBig Skies Guesthouse typically responds to requests in 5-10 minutes.